Congratulations to Clara Young in being recognised by her College in being named as one of 85 sports students on the 2017 Spring Southeastern Conference Academic Roll of Honour. 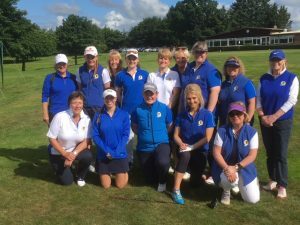 A number of the the county team have been participating in their club championships in recent weeks including Jill McNicoll our County Champion who has retained the Championship title for a 2nd year at Gullane, Pam Hall who has again won the Royal Musselburgh title and Lauren Lee who has won the Musselburgh Championship for the fourth consecutive year. Past captains Barbara Gifford and Dawn Young met in the final at North Berwick and this year Barbara was the winner. The Babe Zaharias competition run again jointly this year with Gullane Ladies to be held on the 21st August is almost full already., so if you are not entered yet get your skates on. Finally good luck to all the East Lothian Ladies taking part in the Scottish Senior Ladies this week at Blairgowrie. The Summer Meeting was played on a glorious sunny day with a bit of a breeze from time to time to stop us getting too hot. How often do we say that! There was some good scoring but others found themselves flagging a bit in the second half. The final was held on Saturday amidst more rain and wind. Connie Jaffrey (The Ladies Golf Club Troon) got of to a wonderful start with a fine display of her short game and putting skills requiring only single putts on six of the first nine holes leading Clara Young (North Berwick)by five holes at the turn. Clara was down but not out. A five hole winning run at the 11th, 12th, 13th, 14th and 15th holes squared the match. A great comeback. A bogey at the 16th saw her go one down again. The 18th saw her plugged in thick and wet rough and unable to move the ball any distance the game was up and Connie won the championship by two holes. Well down Clara on such a great contest and in almost securing the Scootish for a second time. At last the skies cleared and the players did not have to battle the elements. Clara Young started the day with a convincing 6&5 win over 13 year old Anna McKay from Crail before going on to beat Jennifer Saxton from Muckhart 4&3. Clara now meets Connie Jaffrey (Troon Ladies) in the final of the Scottish Women’s Amateur Chamionship tomorrow morning. We wish Clara success in final. The weather has dominated the Scottish Women’s Championship at Royal Aberdeen. Day 1 had full squads of greenkeepers and helpers desperately trying to keep the greens playable and welly boots the preferred foot wear. Day 2 had to be cancelled completely in strong winds which had flag poles almost bent double at times. The qualifying had to be determined solely on the waterlogged day 1 results. This saw Clara Young qualify for the Championship and Stacey Cameron and Sarah Stichbury qualify for the Clark Rosebowl. Day 3 again had the players out in teeming rain. In the Clark Rosebowl Stacey lost in the first round 3&2 to C Wilson (Murcar Links) and Sarah Stichbury at the 19th to Wendy Nicholson. In the Championship Clara won her first round tie against E Watson comfortably 5&4. In the afternoon though she had a battle on her hands when faced with Rachael Polson (Kenmay). Three hole down Clara fought back to square the match at the 18th with a birdie before going on to win at the 19th. congratulations go to Clara in qualifying for the championships and her great play in winning her first two ties. I am sure everyone wishes Clara good luck for today. Well done also to Stacey and Sarah for qualifying for the Rosebowl in the conditions and in battling performances in the ties. 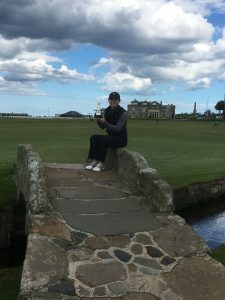 Congratulations to Clara Young on winning the St Rule Trophy at St Andrews today with a final round 71 on the Old Course today. A great achievement. Well done Clara. The runner up one shot behind was Australian Montana Strauss and overnight leader Gemma Clews from England finished two shots behind. Many of our ELLCGA members are busy at the moment playing in club competitions, open days and Scottish events. Here is just a few snippets. Clara Young is currently in contention in the St Rules Trophy. After 2 rounds she is on a three way tie on 139 chasing Gemma Clews who leads the field. Good luck today Clara. Next week Clara Young, Dawn Young, Stacey Cameron, Sarah Stichbury and Dianne Brown will be playing in the Scottish Women’s Amateur Championship at Royal Aberdeen and we wish them all well. Finally Barbara Biggart, free of the responsibilities of County Captain, recently won the Gleneagles Ladies Open Scratch Trophy. Apologies for any major achievements I have missed. I hope to report on many more successes over the summer. East Lothian Junior Grace Crawford set the pace with a wonderful 66 to lead the field in the first round of the girls aged 10 category at Royal Musselburgh. While Grace did not manage to repeat that score she held on to share first place going into the last day. A final round 71 was good enough to give Grace a 3 shot victory. Well done Grace.